ALBEMARLE COUTY: ST. ANNE'S PARISH, REV. ROBERT ROSE. 1772. AMELIA COUNTY: WAS CUT OFF FORM PRINCE GEORGE IN 1734.RALEIGH PARISH WAS ESTABLISHED IN 1735. REV. MUSGRAVE DAWSON WAS THE FIRST MINISTER. HE WAS SUCCEDED BY REV.JOHN BRUNSKILL. CHURCHES: HUNTINGTON, CHIQUAPIN 1749 IN PAINEVILLE, ROCKY RUN, AVERY'S PRIDE & OLD GRUBHILL CHURCH. AMHERST COUNTY CHURCHES- SEPARATED IN 1761 FROM ALBEMARLE COUNTY & ST.ANNE'S PARISH. ROCKFISH GAP, KEYS CHURCH, CALLWAY'S CHURCH & CABELLS CHURCH WITH REV. 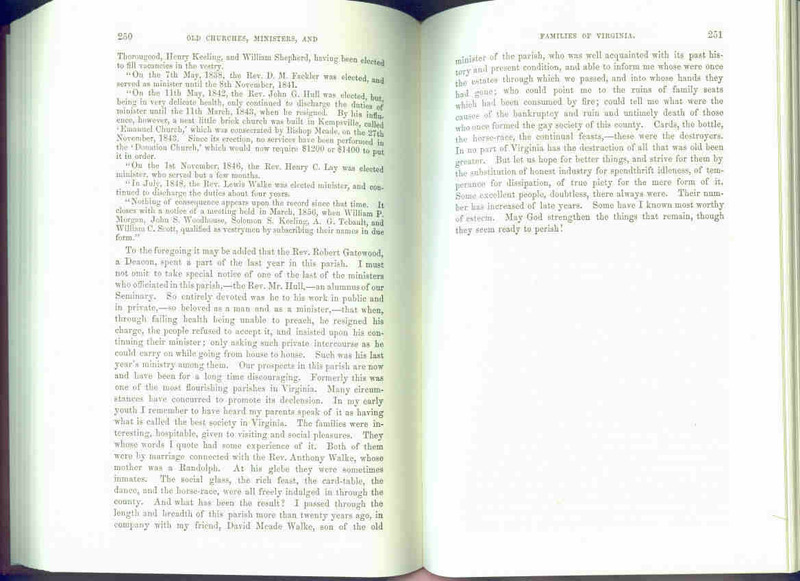 ROBERT ROSE BIO OF CABELLS FAMILY PAGE 60. BEDFORD COUNTY: SEPARTATED FROM LUNENBURGIN 1753. THE PARISH OF RUSSELL WAS ESTABLISHEDAT THE SAME TIME AND WAS ENLARGED IN THE 1754 BY THE ADDITION OF A PART OF ALBEMARLE, THEN OF LARGE EXTENT. THE PRESNT COUNTY OF CAMPBELL WAS INCLUDED IN THEORIGINAL BOUNDS OF THE PARISH OF RUSSELL AND COUNTY OF BEDFORD. THE FIRST MINISTOR FOR BEDFORD IS REV. JOHN BRANDON. CHURCHES: 1. ST. THOMAS 2. LIBERTY 3. TRINITY, AND ST.STEPHEN'S AND PEDLAR'S CHURCH. BOTETOURT, ROCKINHAM, ROCKBRIDGE, GREENBRIER, MONTGOMERY BRIEF OVERVIEW 64-67. BUCKINGHAM COUNTY, TILLOTSON PARISH IN 1757 TILLOTSON PARISH WAS SEPARATED FROM ST. ANNE'S PARISH AND IN THE 1761 THE COUNTY OF BUCKINGHAM WAS TAKEN FROM ALEMARLE. REV. 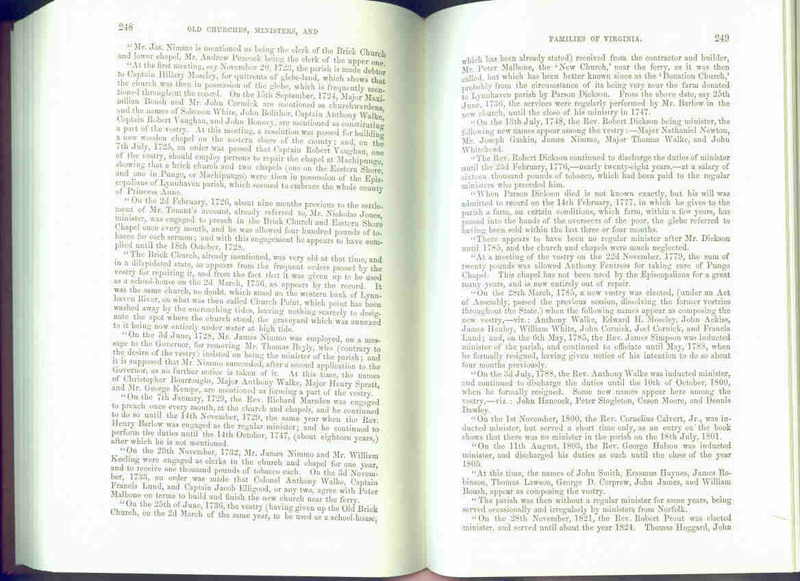 MR. PEASLY IS MINISTER PAGE 38. CAMPBELL COUNTY: SEPARATED IN 1781. FIRST MINISTOR IS REV. AMOS TREDWAY OF LYUNCHBURG PARISH. IN MOORE PARISH THE REV. MR. OSGOOD WAS THE FIRST WHO TUAHGT SCHOOLANDMINISTERED. UNDER HIS CARE. ST. JOHN'S CHURHC WAS ERECTED. FORK CHAPEL & MOUNTAIN CHAPEL ARE CHURCHES IN 1731. THIS WAS MOSTLY A GERMAN SETTLEMENT. BUCKRUN CHURCH. ONE OF THE FIRST MINISTERS WAS REV. MR. STAIGE IN 1728. SEVERAL CHAPELS ARE BUILT IN 1735. IN THIS YEAR 1740 THE PARISH OF ST. MARKS, WHICH WAS STILL IN THE COUNTY OF ORANGE WAS DIVIDED & ST. THOMAS FORMED OUT OF IT. MR. JAMES BARBER & WILLIAM CAVE BEING IN THE NEW PARISH OF ST. THOMAS, MR. WILLIAM TRIPLETTE AND WILLIAM RUSSELL WERE CHOSE IN THEIR ROOM. SOUTHAM PARISH 1745 SEPARATED FROM ST. JAMES NORTHAM IN GOOCHLAND COUNTY, REV. JOHN ROBERTSON. EMANUEL AND ST. LUKE'S CHURCH. TEAR OR TAR WALLETT HILL CHURCH. IT WAS BUILT ON THE LAND OF DANIEL COLEMAN IN WHAT IS NOW LITTLETON PARISH. PETERVILLE CHURCH, SOUTH CHAPEL. FAIR FAX COUNTY: SEPARATED FROM PW IN 1742 AND AT FIRST EMBRACED LOUDON COUNTY. THE WHOLE OF THIS WAS COVERED WITH TRURO PARISH. IN 1749 CAMERON PARISH WAS CUT OFF FROM IT AND WAS AFTERWARDS IN LOUDON, WHEN THAT COUNTY WAS SEPARATED FROM FAIRFAX IN 1757. THE PARISH OF TRURO WAS AGAIN DIVIDED IN 1764. REV. CHS. GREEN WAS THE MINISTER. POHICK OR MOUNT VERNON CHURCH. FAUQUIER COUNTY HAMITLON AND LEEDS PARISHES. 1. ELK RUN AND TURKEY RUN CHURCHES. LEEDS PARISH WAS TAKEN OUT OF HAMILTON IN 1769. THE FIRST & ONLY MINISTER BEFORE THE REV. MR. LEMMON TOOK CHAGE OF IT IN 1816 WS THE REV. JAMES THOMSON. 1. TAYLOR'S CHURCH, WARRENTON, GOODE CREEK CHURCH NEAR SALEM, OLD BULL RUN CHURCH AND PIPERS CHURCH. FLUVANNA COUNTY, SEPARATED FROM ALBEMARLE COUNTY AND ST. ANNE'S PARISH IN 1777. HENRY COUNTY: THE COUNTY OF HENRY WAS SEPARATED FROM PITTSYLVANIA IN THE YEAR 1776, AND THE PARISH OF PATRICK FORM CAMDEN IN 1778. REV. MR. WEBB FIRST MINISTER. KING GEORGE COUNTY: BRUNSWICH PARISH 1720 REV. DANIEL MCDONALD. AND ST. PAUL'S PARISH IN 1766. REV. WILLIAM STUART. LOUISA COUNTY SEPARATED FROM HANOVER, IN THE YEAR 1742, & OF FREDERICKSVILLE PARISH, LOUISA FROM ST. MARTIN'S HANOVER, THE PARISH OF FREDERICKSVILLE WAS ENLARGED BY TAKING IN A PART OF ALBEMARLE LYING NORTH & WEST OF THE RIVANNA. AFTER SOME YEARS FREDERICKSVILLE PARISH WAS DIVIDED INTO FREDERICKSVILLE & TRINITY THE FORMER BEING ALBEMARLE & THE LATER IN LOUISA. THE ONLY PLACE OF WORSHIP WAS THE OLD MOUNT CHAPEL WHERE WALKERS CHURCH AFTERWARD STOOD THE FIRST VESTRY MEET IN 1742. SOUTH CHURCH, OLD PINE STAKE AND ORANGE CHURCHES. NORTHUMBERLAND COUNTY: 1. WYCOMICO REV. JOHN LELAND AND ST. STEPHEN WITH REV. BENJAMIN SEBASTION. NOTTOWAY COUNTY - RALEIGH PARISH SEPARATED FROM AMELIA BETWEEN 1748-1752. REV. WILLIAM PROCTOR MINISTER. THE COUNTY OF ORANGE EMBRACING ST. MARKS PARISH WAS SEPARATED FROM SPOTTSYLVANIA IN THE YEAR 1734. IT WAS BOUNDED SOUTHERLY BY THE LINE OF HANOVER COUNTY , NOTHERLY BY THE GRANT OF LORD FAIFAX AND WESTERLY BY THE UTMOST LIMITS OF VA. IN 1740 FOR THE CONVENIENCE OF MINISTER AND THEOPEOPLE THE PARISH OF ST. MARK WAS DIVIDED. THE SOUTHERLY PORTION INCLUDING A PART OF WHAT IS NOW MADISON COUNTY WAS CALLED ST. THOMAS PARISH & IT'S WESTERN LIMITS WERE SOMWHAT REDUCED. ST. GEORGE PARISH, SPOTTSYLVANIA, OF WHICH ST. THOMAS WAS PART, HAD FOR ITS WESTERN BOUNDARY THE RIVER BEYOND THE HIGH MOUNTAINS, THE SUMMIT OF THE BLUE RIDGE BEING MADE THE WESTERN LIMITS OF ST. THOMAS PARISH. THE PINE STAKE CHURCH, THE MIDDLE OR BRICK CHURCH & THE ORANGE CHURCH. ARE PART OF ST. THOMAS PARISH. PRINCE EDWARD COUNTY: REV. JAMES GARDEN. 1. CHAPEL OR WATKINS CHURCH 2. FRENCH'S CHURCH 3. SANDY RIVER CHURCH. PRINCE WILLIAM COUNTY: DETTINGEN PARISH, TAKEN OUT OF HAMITLON PARISH WHICH IN 1745 COVERED ALL OF WHAT IS NOW PRINCE WILLIAM AND FAUQUIER. REV. MR. KEITH. 1. Ebenezer Baptist Church is the oldest black church in existence today. It was established on the plantation of Jhn cornickin 1859. RICHMOND COUNTY: FARNHAM ESTABLISHED 1693 WHEN RAPPAHANNOCK COUNTY WAS STRICKEN FROMT HE LIST OF COUNTIES & RICHMOND & ESSEX ERECTED IN ITS STEAD, & SOUTH FARNHAM PARISH CREATED IN ESSEX. THE FIRST MINISTER WAS REV. WILLIAM MACKAY, AND LUNENBURG PARISHES. ST. MARY'S. SPOTTSYLVANIA COUNTY: ESTABLISHEDI N 1720, BEING TAKEN FROM THE COUNITES OF ESSEX,KING WILLIAM ANDKINGA ND QUEEN. THE PARISH WAS DIVIDED IN 1730 INTO ST. GEORGE'S AND ST.MARK'S. ST. MARK'S MAKING UP ALL OF WHAT IS NOW ORANGE COUNTY, MADISON COUNTY CULPPER AND RAPPAHANNOCK. 2. BERKLEY PARISH WAS TAKEN FROM ST. GEORGE IN 1769. REV. JAMES STEPHENSON. STAFFORD COUNTY: OVERWHARTON PARISH. HAMILTON PARISH. REV. ALEXANDER SCOTT. WESTMORELAND COUNTY 1753 FROM NORTHUMBERLAND. COPLE PARISH WITH REV. CHARLES ROSE. YEOCOMICO RIVER CHAPEL 2. NOMINY. WASHINGTON PARISH 1723 REV. LAURENCE DE BUTTS MINISTER. CHURCHES INLCUDE: 1. ROUND HILL 2. POPE CREEK CHURCH, AND 3. LEEDS OR BRAY'S. MEADS BOOK. CLICK HERE FOR THE SURNAME PAGE. MAKE SURE YOU SAY "MEADE BOOK" WHEN REQUESTING LOOK UP.